OROCIT® is a scientifically advanced adjuvant designed specifically for improving the efficacy of inputs for the citrus industry. It has been shown to provide superior results when mixed with pesticides for the control of Asian Citrus Psyllid and other insect and disease pests. OROCIT provides superior spreading, wetting and penetration compared to alternative surfactants such as crop oil concentrates (COC), methylated seed oils (MSO), high surfactant methylated seed oils (HSMSO), silicone surfactants (SS) and non-ionic surfactants (NIS). OROCIT has been extensively field tested and is an excellent spreader of contact pesticides when mixed at low rates and when mixed at higher rates provides penetration of inputs to a tree’s phloem to distribute materials throughout the tree and the roots. A recent Oro Agri-commissioned study conducted by the University of Illinois has shown the TransPhloemTM technology contained in OROCIT offers producers improved translocation of herbicides to kill weeds faster and improve field conditions for all commercial crops. 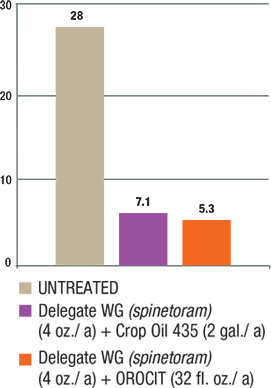 OROCIT provides superior results compared to other adjuvant types and various crop oils, resulting in faster weed kill to improve the potential for higher yields. 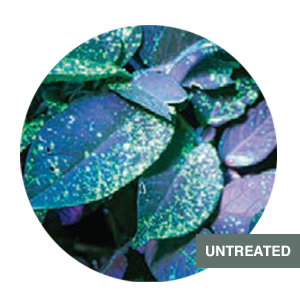 TransPhloemTM technology, incorporated in all Oro Agri foliar-applied adjuvants including WETCIT®, VINTRE®, OROCIT® and OROBOOST®, quickens the translocation of systemic herbicides throughout the plant leading to a faster kill off. 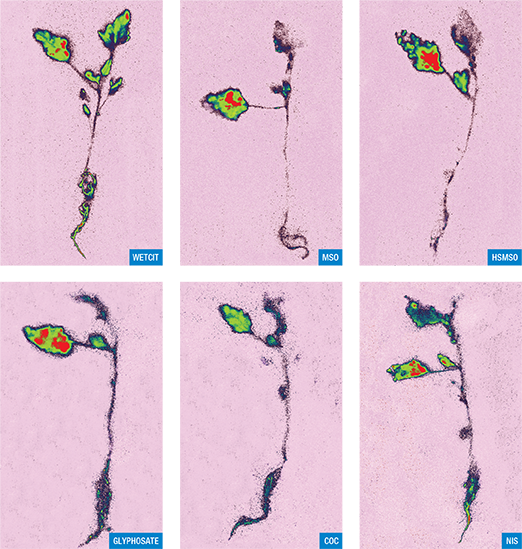 In the pictures above, an application of an Oro Agri adjuvant containing TransPhloemTM technology combined with glyphosate resulted in a quicker kill of the lambsquarter weed. Superior spreading, wetting and penetration for superior results. OROCIT with TransPhloemTM technology provides the ideal method for improving the efficacy of pesticide applications. 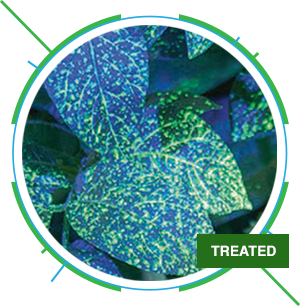 Field tests have shown OROCIT provides better coverage and penetration to deliver more active ingredients into plants and provide a more complete barrier to infestation. Unlike oil-based adjuvants, OROCIT does not leave sticky residues and provides quicker and more complete penetration through leaf surfaces. Better spreading and better absorption for better results. OROCIT with TransPhloemTM technology maximizes foliar fertilization by increasing absorption of nutrients through superior deposition and penetration through leaf surfaces. TransPhloemTM technology allows for faster and more complete nutrient movement into and throughout plants than other adjuvants and surfactants. Better absorption with OROCIT’s proprietary formulation can increase quality and the potential for higher yields. A real benefit to growers is the versatility OROCIT adjuvant brings to spray programs. 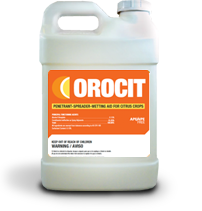 OROCIT has the capability to act as a wetter, spreader, penetrant and a translocation aid depending on the use rate. Regardless of whether you are spraying a contact or systemic pesticide or foliar nutrient OROCIT can deliver it to the desired action site — giving the active ingredients the best chance for peak performance. This makes selecting the right adjuvant simple and means you don’t have to buy several adjuvants for your different spray programs. Mix 16 – 96 ounces per acre in sufficient water to provide complete coverage. Do not exceed a usage rate greater than 0.3% v/v. Do not exceed 64 ounces per acre during June to September high volume sprays (>400 gpa). Use 16 -32 ounces for spreading and wetting of contact pesticides. Use 32- 96 ounces per acre for spreading, wetting and penetration of systemic pesticides and nutrients. Mix 16 to 100 ounces per 100 gallons of water. Use 16 -32 ounces for spreading and wetting of contact herbicides. Use 32- 96 ounces per acre for spreading, wetting and penetration of systemic herbicides. Use a higher rate when weeds are mature, hardened off or under stress.